I mentioned the Biocube Nano-Tank before but this is another new one called the Aquapod. The AquaPod offers all-in-one elegance with a new standard of performance. The modern style compliments and decor and features seamless front rounded glass corners for optimum viewing. The contrast of the black back will highlight the vibrant colors of fish, invertebrates and plants. Hidden under the sleek canopy you'll find a sophisticated lighting system that screams with performance and efficiency - it features two dual color SunPaq compact fluorescent lamps, an internal electronic driving system and Nocturnal Blue Lunar Lights to complete the 24-hour lighting cycle. Combine all of this with our ultra-efficient surface skimming filter and it is quite simply a system we are proud to call AquaPod. Utilizing industry breakthrough lighting technology from Current gives optimum output and performance. The ultimate lighting spectrum is achieved by utilizing two Dual SunPaq lamps – which combined with the SunPaq driving system produces over 50% more lumen output then comparable systems. Using a proprietary blend of Nichia phosphors, the dual phosphor technology produces eye popping color rendering, while providing the necessary lumen output for high coral growth. Polished German Parabolic Reflector pumps up the light output while a polycarbonate splash lens protects the lamps and ballasts from corrosion. Independently controlled, internal electronic driving system unleashes the power of the SunPaq lamps while preserving and extending lamp life. The patented circuitry inside each UL-listed ballast ensures consistent high performance and low energy consumption. A high-CFM cooling fan cools the ballast and lamps for peak performance and long life. Strategically placed air vents on the lid allow proper air circulation for optimum cooling. Nocturnal Blue Lunar Lights cast a mysterious nighttime glow in the tank creating a dark moonlight effect – creating the perfect environment for viewing nocturnal habits and stimulating spawning of your captive inhabitants. 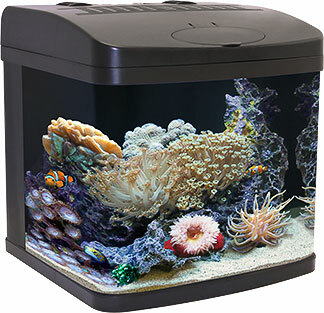 The seamless rounded front corners provide a panoramic view of your aquatic creatures. The thick high quality glass is bent and seamed with unparalleled precision while the reinforced tank frame provides optimum tank support. All this to provide the perfect viewing portal to your underwater garden. Each AquaPod includes tank, lighting system, integrated filtration system, submersible pump, mechanical sponge filter, and instructions. Model 7050 includes additional ceramic media, bioballs and activated carbon. Model 7051 & 7052 feature an adjustable weir overflow filtration system. The Aquapod is manufactured by Current-USA. Our own member SHIFT_9K actually purchased one and detailed his setup at this thread. He's got alot of pictures and cool information so check it out. don’t forget us 12 gallon-ers! I will never be happy with such a tiny tank. A little to small for me.